Time has rolled around again for another AT board meeting. I’ve taken a look at some of the key reports to hopefully find some interesting information. There are a few items on the closed agenda for next week but two look the most interesting and both seem to be related to buying more trains. With noise of AT getting more increasing, I wonder if we’ll be hearing an announcement about it soon? Work progressing to understand the requirement for a further order of EMUs to meet continued high growth in passenger demand together with a review of vehicle type and configuration. Wiri Depot -we continue to investigate supply of a second shunter if the proposed modifications to existing shunter prove not to be viable. A preferred site for the proposed wash bay / spray booth has been identified. New Train Timetables – There is news of a new rail timetable, but it’s not due till next year. Unfortunately, it looks like it still won’t include all day/week frequent trains like their official plans have promised, however there are some other good changes likely. Still this new timetable will be over a year away. Discussions have commenced for the 2018 train timetable upgrade, with a tentative introduction of July 2018, subject to the closure of Sarawia Street level crossing, and EMU enhancements. Specification includes: Western and Southern Line services to call at Parnell Station; journey time and dwell time improvements; Pukekohe Shuttle services operating on a 20-minute frequency from 0700-1900 week day and 30-minute weekend; later evening services throughout the week across the network and 20-minute services to operate later in evening; 20- minute interpeak weekend on electrified network; later services on New Year’s Eve; peak capacity increase through freeing of train set through reduced journey times. AT, NZTA and the Airport Company have jointly completed a programme business case for improving access to the airport. The business case anticipates doubling the frequency of the existing 380 bus route to the airport by the end of the year with more bus routes servicing the airport by 2020. These additional bus routes would be through added or extended bus services to the airport from New Lynn, Sylvia Park and Botany with an upgrade of the Puhunui rail station to a full bus/rail interchange also envisaged by 2020. AT is also progressing business cases for the route protection of the Airport to City and Airport to Botany mass transit corridors. That’s only going to get better with more cycle projects coming, for where there are updates on a number of them. A lot appear to be in advanced stages of design which is not surprising as many of them need to be finished by mid-2018 when the government’s Urban Cycleway Fund (currently) ends. Detailed design for Ian McKinnon Dr is now 85% complete. Funding of $4.74m was approved for implementation of the Karanagahape Rd cycleway, likely to be for the detailed design which the report separately says is under procurement. AT received 1,200 submissions on the Pt Chev to Westmere consultation which they’re analysing. Detailed design is also underway for the cycleway on Gt North Rd between Williamson Rd and K Rd. They say construction is likely to start in late October. AT are hoping to go live in late August with a rebuild of their HOP website which they say will deliver better functionality for customers. They also say they are experiencing delays with getting the Thales (back end system) to work reliably. CCTV Analytics Build: The Bus Lane Enforcement pilot project is now complete and the initial results are very positive. These are being reviewed by the Parking team prior to rolling this solution out to other transit lanes. The Eastern Busway – continues to slowly progress, they say hearings for the consent of the Panmure to Pakuranga stage are set for August while in September they expect to award a contract for design and consenting of the stage to Botany. ATs Travel Plan – AT give some figures on how their staff get to work. The information comes as part of ATs work on updating their own travel plan. They say that over 1,200 staff replied and 33% of them drive to work alone and 43% catch a bus or train. HOP fares for ferries – AT are still working on the issue of ferry fares and integration with HOP although they again make it clear that fares won’t be equal with buses and trains. New Network – The new bus network in East Auckland is confirmed to go live on 10 December. Station Gating – Gating is progressing at a number of stations across the rail network with installation now occurring too, such as below at Henderson. Glen Innes has been on the list to be done before but AT now say it “is being planned as part of a broader station upgrade with Tamaki Redevelopment Project”. There’s plenty more in the report. If you’ve read it was there anything interesting I’ve missed? Ian McKinnon Dr cycleway – Interesting project that would be… Cars scream along there right until they’re on Dom Rd by the View Rd intersection. Do you know how far along Dom Rd the cycleway is to go, or if it’s to be a segregated RoW? I’d assume they’re just planning some paint on the existing pedestrian path? Great news on the gates and red light cameras. Shame that my regular issue of PaperBoy will now be locked behind the gates. IIRC you have a 20-minute window to tag in and out of the same station for free, so if you have a HOP card you can go in for it. Sweet cheers! Didn’t know that. It’s at least 20 mins. I’ve been departing Britomart on the train for home, got a call from my wife suggesting we do dinner with friends in town, changed trains at Newmarket to go back to Britomart, tagged back off without paying anything. Interesting the additional bus routes to the airport and finally some sound of common sense with the doubling of the 380 route. I worry a bit about patronage on the 380 – hopefully better frequency will be a major attractor. They could increase patronage on the 380 if the AT Journey Planner would automatically show it instead of the Skybus, with a “Do you want to pay more?” button at the side. Yes, Google is good at the “Less walking”, Prefer Train, or Bus, less Transfers options. So excited about the 380 actually getting down to a usable frequency! I’ve used the 380/train connection a few times, but if you arrive at the airport and the real time board is saying 29 minutes to the next one it’s a major heart sink! 15minute frequency / average wait 7.5 minutes is pretty good and will give the expensive Skybus a run for their money. Is the IPEMU referring to battery powered EMU or overhead wires EMU like the rest of network? Also, with the urban cycling fund, I may have missed it, but was there any extension to the program in the budget? Or any mention whatsoever? It’s been a great shot in the arm and so much bang for your buck with this investment. I hope the program gets continued by whoever’s controlling the treasury benches come September 24. I was wondering if anyone know whether the new gates will be able to process both HOP Cards and Printed Tickets? The new gates seems to have be high which means no need for constant presence of an AT Staff to let paper ticket holders in and out of the station. They don’t, gatelines will be fully manned, the paper ticket gate will be controlled by someone in a booth. Apart from checking paper tickets, the staffing is more about helping people through (prams, wheelchairs, luggage, bikes, parents with children riding free, etc) the stopping people jumping over the top. It is exciting to see AT finally do something to improve the EMU dwell time and speed. However the last timetable improvement we promised a lot hype, but disappointed to only delivery 1-3 minute improvement in the total journey time. I hope this time the improvment is more significant. Off peak frequency of 20 min is not enough. its those damned slow doors and steps. Instant control from the train manager or driver and get rid of the passenger operated doors. They failed miserably on the ADL’s and ADK’s when they first came here and its seems like pride in not admitting a stupid decision that they have retained the current system. And please add extra balises (sensor that tells the train computer that the signal ahead has cleared) for the 3 cars so take offs from platforms can leave faster than an asthmatic rat. Currently set up and positioned for 6 cars. Not convinced that its passenger operation that’s the problem, seems much slower than the Wellington set up – which is all passenger operated. There has been a lot of debate on here about it in the past, but one things seems certain – it is a combination of a number of factors. As you say the only noticeable difference with Wellington is the lack of ramps, however the ramps don’t explain a 20 second difference between the cities. There appears to be a lot of lag in the Auckland system between pressing buttons and things actually happening. When you add this to the lag from when the train stops to when the green light is available, the lag between the last door closing and the TM being able to signal the driver, and the lag between the TM signalling the driver and the train moving this seems to explain a big chunk of why Auckland is slower than many other places. Not sure if the trailer car ramps are really that bad, the dwell time seems very similar when they are used compared to when they are not. I find most dwells are waiting for the doors to release – sometimes instant sometimes like 5-10 seconds, and also after the ROW is given there is a long time often waiting for either the LE to get moving or possibly at times the signal to change sometimes as much as 30 seconds. Also if passengers boarding/alighting are a cause for delay then why are the off-peak timetables exactly the same as peak? I am looking on enviously at the growing cycle network from south of the bombays. Looking forward to seeing the 2017 Auckland Cycling Account when it comes out, but those figures in your post are very encouraging. 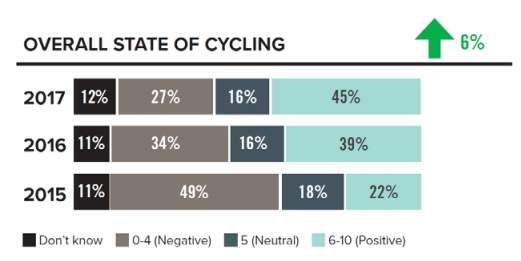 Fully 22% of respondents have changed from being negative about the overall state of cycling to being positive about it. That change in just 2 years is remarkable. Gosh I’d be interested to know how they work out the social cost of serious injuries. From what I know in my own family, the effects are very long-lasting, involving many people in many generations. Good social services and timely help would have reduced this, or course. Which is another reason why it is important to put a figure on it, I suppose, to justify the expense of these sorts of services. There is some information in here. It’s a fascinating (and morbid) subject. Nothing on grade separation of level crossings? Being able to top up a HOP card online and not have to wait up to 48hours for it to be useable would be good. IPEMU sound expensive, lots of batteries and additional power control. I assume these won’t just be operating Drury-Pukekohe, so we’d need quite a few in order to run Britomart-Pukekohe. Wonder how the costs of the EMU’s, additional servicing requirements, scheduling constraints, etc., compared with just electrifying to Pukekohe and running standard EMU’s. One hopes that an un-biased, non-agenda-skewed business-case will give an accurate picture of the whole-of-life costs of the battery-EMU option versus extending the wires. As pressure mounts for full electrification to Hamilton, it might be premature to purchase IPEMU’s if PAP-PUK electrification can be justified for wider reasons. Unless there is a plan to maybe redeploy the IPEMU’s to serve Waitakere/Kumeu/Waimauku. And will the IPEMU’s be specified with a range to serve Tuakau, Pokeno? (/Helensville?). I fear there is a risk of this being a half-baked and future-limiting solution, particularly if it then provides excuses to further delay what should really be done. Battery EMUs are a known quantum. They would be identical to the existing EMUs, except for the extra cost of the battery pack. The battery pack has a known cost and a known life, it will work for a fixed amount of years (indications are something like four or five years based on international experience) before being exhausted and fully depreciated. The BEMUS could then be redeployed as regular EMUs, simply by pulling the batteries off the roof, or re-battery’d for another life cycle. It’s a simple evaluation to compare the costs of this option to the option of going straight to installing overhead line and buying more standard EMUs. If the time-value of delaying the capital to install overhead for the four or five years is greater than the cost of X battery units for the new fleet, then its a go. My guess is they’ll probably find that BEMUs for one battery lifecycle, followed by removal of the spent batteries and installing catenary, will be an efficient programme. +1, it would take the best part of 5 years to get the catenary to Pukekohe even if we gave Kiwirail the money tomorrow anyway. I suspect that the IPEMUs are more likely to be diesel bi-modes than battery ones – it’s a more mature technology, becoming more common in places tthe UK and Europe. How easy is it to remove the diesel engines from these at a later date and increase the seating capacity? The advantage of the BEMUs seemed to be that the battery pack would replace seating, which meant it could be removed and replaced with seating once Pukekohe is electrified. Until we know more about the proposed IPEMU design, the possiblity of converting them to straight EMUs must be just conjecture (particularly sInce I don’t think anyone has actually done such a conversion). If the equipment is installed in the passenger compartment (as diesel engines on German tramtrains are), in theory it shouldn’t make a lot of difference what it is that could be removed to make extra passenger space. Can’t help thinking that diesel bi-mode emus would be a mistake even though it could be a serious contender. The battery emu looks much more interesting and it would be good to see some OLE around Pukekohe to at least allow battery charging. Maybe a way of getting OLE incrementally installed especially if intermediate stations planned for near future do the same. Apparently the battery kit costs about 20% extra on top of the EMU, according to a VOAKL post. Given the EMUs are about $9-10m, that means $2m per train for the battery. With 18 new trains proposed on order that’s $36m to ‘electrify’ to Pukekohe for the life of the batteries, vs about $150m to wire up. Would actually be interesting comparison on the NPV analysis, not sure which is more economic. Probably depends on whether those batteries last four or five years or seven or eight. Hope they get a warranty! BEMUs would definitely be on the rails faster. Jezza, I really doubt the battery packs would be inside the passenger cabin for fire and safety reasons. They be either under the floor or on the roof. On battery LRT (which is more common) they are always on the roof, but that’s because LRT is low floor and doesn’t really have any space under the floor. Not that our EMUs really do either. I’d be 99% sure they’d be roof mounted. Roof mounted batteries would probably need to be fairly lightweight types whereas high energy storage batteries such as Lithium Iron technology are very very heavy. These are more likely to be in cabin or under floor in heavy designed storage lockers, fireproof and crash proof. It will be interesting to view the BEMU specs. Nick R: you seem to have missed the bit in that Radio NZ article that says that battery EMUs could go ahead “if [AT] can find the right technology”. They’re not (yet) a mature technology, unlike diesel bi-modes. Ok but they aren’t looking at bi mode diesel, they are looking at batteries. If not batteries they’ll just keep running the diesel shuttle. So if batteries don’t work there are no plans to increase the number of EMUs? That’s going to result in some serious issues in a few years. No I’m pretty sure they still plan on more EMUs for the rest of the network, but just not for Pukekohe if the battery thing doesn’t pan out. They’d just keep running the diesel shuttle. 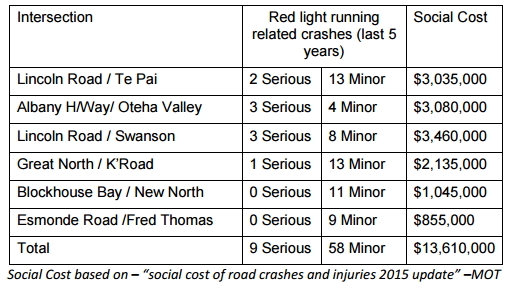 There are still questions over whether or not the BEMUs will have their top speed and acceleration de-rated when off-wires, which could mean the benefits compared to the DMUs are less (except for the single seat ride), especially with extra new stations between Papakura and Pukekohe. Otherwise normal operation should be at usual acceleration and top speed. Yes, hope business case is done well. Thing is this opens up a whole set of possibilities which may be hard to make a case for. Rather than the Hamilton to Auckland ideas, using IPEMU’s to incrementally expand the range of the electrified range sounds like a good idea to me. First to Pukekohe, perhaps to Tuakau (with Waikato help), then electrify to Puke, add in Drury, Drury South & Paerata stations. IPEMU then extends to Pokeno & perhaps to Mercer if this area is planned/gets a housing increase. On it goes, incrementally all the way to Hamilton. Alternatively after electrification to Puke, units then redeployed to serve Waitakere/Kumeu/Waimauku. This idea gives a lot flexibility in my mind rather than the more rigid electrification of line planning. If cars are going battery powered, surely trains can do it. Look at what is happening in the UK at present with the bi-mode IEP trains. As soon as the government saw that the new electric trains could work off the wires, they have cancelled most of the planned future electrification projects. And I think I read that when the IEPs are working in diesel mode, they are slower (or at least no faster) than the old 30+ year old diesel HSTs that they are to replace. Yes but that is the UK and they are Diesels. Point taken it is a risk politically but also a risk nothing happens for a long time for Puke or further south waiting on wires (remember the motorway rail tunnel is an issue too?). IPEMUs using the current CAF EMU body will be unlikely to be permitted to run through the Waitakere Tunnel, without the tunnel being enlarged or bypassed, as there is inadequate space for emergency evacuation of passengers. Might be a good idea to fit Matangi-type cabs to those IPEMU’s, with end-doors! Yeah, Waitakere tunnel worked fine for decades of passenger transport, but it’s now considered unsafe. I’m guessing that is in relation to the post-Pike River mine era of OSH. AT Hop top up sometimes taking 24-72 hours isn’t an AT issue, it’s a banking one. I work for a company that uses the POLi direct bank account payment software that’s used by airlines and other companies to offer a payment option that doesn’t involve card booking fees. I can advise that if something goes awry with a booking on an airline/railway/bus etc website and it’s a Friday (especially after 10pm) or weekend the booking will not be able to be done till Monday or Tuesday or even Wednesday where say Monday is a public holiday as the funds do not reach the merchant’s bank account till then because Sat, Sun, and public holidays aren’t bank business days. That’s the issue. The advice would be to make sure the next day after you top up is still a banking business day if you want to see your account topped up the next morning, i.e top up before Friday, especially if it’s going to be a long weekend. In my experience Snapper, Spark and Opal topups are immediate, whatever the day of the week, and internet banking does well-nigh immediate transactions (certainly same day, whatever the day) so I don’t know why AT Hop shouldn’t be able to do the same. CCTV Analytics sounds like software that would be able to read moving images, so could well be bus mounted lane monitoring cameras. Lets hope so, I think that would make people think very seriously about being in a bus lane. Automatic License Plate Recognition (ALPR) is a very mature field now. Recognition rates are 90-98% now, so the human load of non-recognised plates should be very low. If you wan’t to have a play with plate recognition yourself, or see how far the science has come, OpenALPR is pretty impressive. for the first couple of years after returning from London I was super paranoid about being caught in a bus lane because of that technology, even a wheel over the line seemed to qualify for 150quid fine through the post..but of course there seems to be very little enforcement here. Not necessarily advocating for cameras everywhere (it really is very big brother-ish in the UK) but this would soon sort out poor driving behaviours in Auckland! Great to have 3 per hour shuttles on the Papakura – Pukekohe route. Any reason this can’t be introduced earlier ? Pukekohe put on for us, I got a “No, we don’t do that ” reply. Rumors around the shuttles could see them replaced by buses if train drivers keep leaving at the current rate. It can’t be introduced earlier due to the current driver shortage, Puke shuttles were cancelled during the opening of the Masters games due to lack of drivers and there has been a few leave (not replaced yet) since. Grumpysmurf for some reason the censor doesn’t want you to get an answer to the question about running the extra services to Puke now, hopefully they will get over themselves even if they don’t like the facts. So new time table next year now! That would be because Transdev are hemaraging drivers. Short 15+ last count. The Company has a toxic work culture defined by middle management incompetence. Hidden your driver count is about six weeks old, it is in now well in excess of twenty but it is more to do with rosters (under pressure from the SMT and AT) than middle management incompetence.